Great Field looked an exciting prospect when cruising to an impressive victory in the Grade 1 over two miles for trainer Willie Mullins and jockey Jody McGarvey, who was celebrating his first top-level success. J P McManus's six-year-old made it four wins from as many starts over fences as he came home 11 lengths clear of Ordinary World. "Jody and he make a great team. Jody was very brave and the horse responded. He's a horse with a super engine, he loves jumping and obviously has huge talent," said Mullins. "He was just getting into a nice rhythm. There was less worry today than other days and that was probably due to the better ground. "When he jumped clear you could really see him for what he is. We always thought he was a fantastic horse and were disappointed when he pulled up at Cheltenham last year. "He's obviously a nice horse for the future and we'll talk to J P (McManus) and Frank (Berry) about what they want to do. They have a lot of horses so they need to keep them apart." 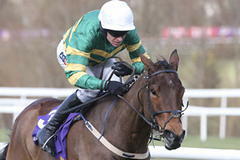 A delighted McGarvey added: "The saddle was gone going to the second last. He can get in and give a few a rub - I'd say he rubbed one a bit too hard and brought the girth with him. I was just hoping it would stay in place after the last. There was a sigh of relief to say the least when we got away safely from the last. "But what a horse, what an engine. The speed he was going a couple of times down the back, I was long. It was do or die and he came. He has his own way of doing things, but is rock solid on his feet. I am very lucky to be sitting on him. It is the best feeling in the world. "At the start of the year, you have the festivals to look forward to. I was hoping to get a ride, but never thought I'd be coming here riding an odds-on shot from Willie Mullins in a Grade 1. Just being here is a great thrill - to go and win is just marvelous."